NORHIZAM Hassan Baktee must have worked hard to eventually become a wakil rakyat. NORHIZAM Hassan Baktee must have worked hard to eventually become a wakil rakyat. In the May 9 historic general election, Norhizam found himself an elected representative of the people of Pengkalan Batu, Melaka. 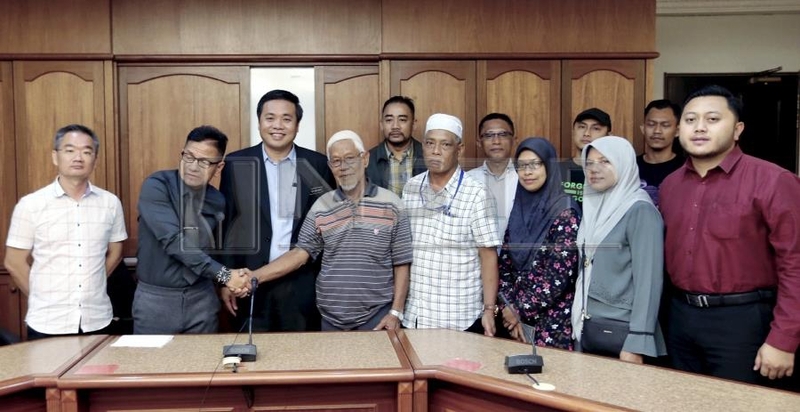 He beat candidates from Pas and Barisan Nasional, making him one of Melaka’s new lawmakers. This was a sensational victory, along with many other results on that same night. His success didn’t stop there. He was picked by Chief Minister Adly Zahari to become the state executive council (state exco) member for agriculture, entrepreneur development and agro-based industry. In layman’s term, Norhizam is one of the select few to hold an important portfolio to chart the state’s development. There are others who believe that Norhizam wouldn’t have succeeded on his own. He won the election on the strength that there was a nationwide momentum to support Pakatan Harapan to topple Barisan Nasional. So he was riding on the wave created by Tun Dr Mahathir Mohamad as the 93-year-old statesman reclaimed his prime ministership to become the county’s seventh PM. Norhizam was picked for the ride and saw himself propelled as a state leader, tasked with taking Melaka to another level of development. Norhizam wasn’t the only one who rode the wave and came out a winner. Overnight, Malaysia saw many first-time wakil rakyat at both the federal and state levels. Indeed, there was euphoria never seen before in the country’s political landscape. BN suffered more than just a major defeat at the polls. The coalition which held office for more than 60 years, suddenly found itself in turmoil and appears rudderless today. For wakil rakyat like Norhizam, this euphoria must still be with him till today. He must have felt that nothing could ever go wrong for him politically. And having been picked to become a state exco member, he must have felt that his political career was indeed due to his own capabilities and popularity. He must have felt that he was invincible, which explained why he is called the “Hulk” in his constituency. We all like confident personalities, whose charm can go a long way in winning votes and getting things done. But this was where Norhizam erred. He claimed that he is one of the most hardworking state assemblymen, going down to meet his constituents and engaging them whenever possible. No one in their right mind would take offence with a wakil rakyat if they work sincerely and consistently. But his argument with kampung folks at Kampong Pulau Nibong last week was shameful, to say the least. For Norhizam to go down to meet voters is very good indeed, but arguing in the street with voters is not good behaviour, to say the least. The street verbal brawl was caught on camera and placed on social media very soon after. Incidents like this attract a lot of interest, and the visual made its way into almost every smartphone in the country. Norhizam’s conversation became very heated, prompting him to react in a very unflattering manner. The villagers of Kampung Pulai Nibong brought up an issue about a road being closed at a residential area near the village. It’s not the road issue that met with disapproval from ordinary folks. Rather, it was Norhizam’s rude manner that caught everyone’s attention. His remarks made many voters conclude that Norhizam was an unfit lawmaker and should be sacked. That shouting match produced this quote: “Siapa YB? Awak YB kah saya YB?” In his case, Norhizam showed his false pride in being a wakil rakyat, not realising that the badge of a wakil rakyat is to be worn with humility and dignity. Certainly not with the kind of arrogant utterances Norhizam spewed. Norhizam must be made to realise that their salaries are being paid by the rakyat, the kampung folks included. And shouting at voters will cost him dearly. Norhizam may not know that perception counts a lot in politics. He must not only be seen to be professional, but must be one too. Arguing with voters in the street will help make Norhizam, and others like him, be a one-term wakil rakyat. Form and substance go hand in hand in politics. The people don’t forget easily. If he doesn’t show some humility in the coming years, voters must help him take up another job, one that suits his personality. He had also threatened to sue anyone who passed his visual around. The visual is already viral, stored in smartphones and set to be released again and again in the future. I wonder who has been giving him advice about wanting to sue anyone sharing the visual. YB Norhizam may mean well in his engagements with voters. But his position, which the voters got together to give him, is nothing but a temporary licence to be the people’s servant. He has already apologised to the kampung folks for his indecent behaviour. But damage is already done. Good luck, YB! You have plenty to do to win back the people’s trust. It won’t be easy, but it certainly is not impossible. Sociologists define hypocrisy as not putting into practice what one has preached, not walking the talk or publicly depicting oneself as a guardian of moral norms for others to emulate, but violating them in private.